DIT stages first ever conference to strengthen economic ties between the UK and the gulf through sharing British expertise in PPPs. 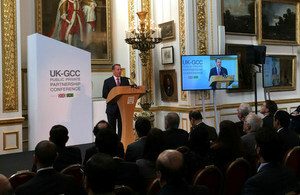 In the first event of its kind with the Gulf, International Trade Secretary Dr Liam Fox today opened the UK-GCC Public Private Partnership (PPP) conference to show how UK expertise can maximise the innovation of both public and private sectors to transform their societies. The conference will bring together ministers and senior representatives from Gulf Cooperation Council (GCC) member states, led by H.E Dr Abdulatif bin Rashid Al Zayani, Secretary-General of the GCC, to look at how PPPs can be used to inform national diversification plans. From the Qatar National Vision to Saudi Vision 2030, the Gulf is looking for opportunities to diversify and shape their economies to face the challenges of the future, from infrastructure to healthcare and education. The UK has considerable experience in the area of public private partnerships, which enable the public sector to access the discipline, skills and expertise of the private sector, and for many years has been home to one of the world’s largest and most experienced PPP markets. UK companies with a proven track record across a range of sectors will share their expertise at the conference. The UK consistently shows how collaboration with the private sector can lead to innovation in public sector services. Today’s conference is not only an opportunity for the GCC nations to capitalise on our extensive knowledge and experience in this area, but is also a springboard for our growing future trading relationship. The UK and Gulf states share a strong and growing trade and investment relationship, and the connections that are made today between government and business will help to shape a better future for all our nations. The conference is focused on the implementation of the GCC-UK 2016 Summit and the Joint Action Plan agreed between the GCC and the United Kingdom on increasing opportunities for investment between the 2 sides. The conference also presents the national transformation programs, and the economic diversification plans adopted by the GCC. It also presents the laws enacted by the GCC countries to increase opportunities for foreign investors in the sectors of infrastructure, health, telecommunications, energy, information technology and other sectors. This is in pursuit of strengthening their economies and diversifying their resources. The conference will also provide a further opportunity to expand and deepen the trading relationship between the UK and the GCC. UK companies export over £30 billion worth of goods and services to the GCC nations every year and thousands of British companies are active across the Gulf, creating jobs and helping to deliver projects from energy expansion, to helping Qatar prepare to host the 2022 World Cup. Like countries within the GCC – the UK government is embarking upon a bold industrial strategy, taking the big investment decisions required on capital projects to stimulate our economy and project our prosperity far into the future. Our infrastructure plans include over £300 billion worth of investment by 2020 to 2021, over 50% of which will be financed and delivered by the private sector, both domestic and international. The Department for International Trade (DIT) is also offering practical support to expand the UK-GCC relationship. Through UK Export Finance, we can provide up to £30 billion in support for UK companies exporting globally, and for their buyers in both the public and private sectors. In addition, UK Export Finance support will now be available in all of the GCC’s currencies, allowing the region’s buyers to access finance in their own currency and making the UK’s world-leading goods and services even more competitive.